Sony BDV-E300 review | What Hi-Fi? 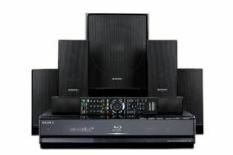 The positive vibes start before you even turn the Sony BDV-E300 system on. The satellites are fairly nondescript, but the main unit has both good looks and build quality. This is also one of few systems with mic-driven speaker calibration. It's very accurate, too, so you can be confident you're getting the best from your system. And the Sony's best is simply superb. Playing Slumdog Millionaire, it's clear that dynamically this is the best at the price. The thwack as cricket bat hits ball has loads of impact against the boys' chatter, but the landing plane is a whole other level of sudden, sofa-rattling excitement. Detail levels are impressive throughout, and the drive and attack make for a thrilling performance. The satellites disperse well; the surrounds meet more harmoniously with the fronts, and join up behind the listening position, creating a genuinely immersive, atmospheric experience. That slimline centre has a slightly different character from the satellites, so it isn't quite as unified across the front as some peers, but it's close. What's more, the satellites as a whole dig deeper than most of this size, giving extra body to the midrange and making subwoofer integration easier. It's splendid with sound, then. Better still, sharing DNA with Sony's Blu-ray players means it's also a master of video. Images from both Blu-ray and DVD discs have an extra degree of realism in colours and detail, and are more eye-popping as a result. The BDV-E300 was worth the wait.